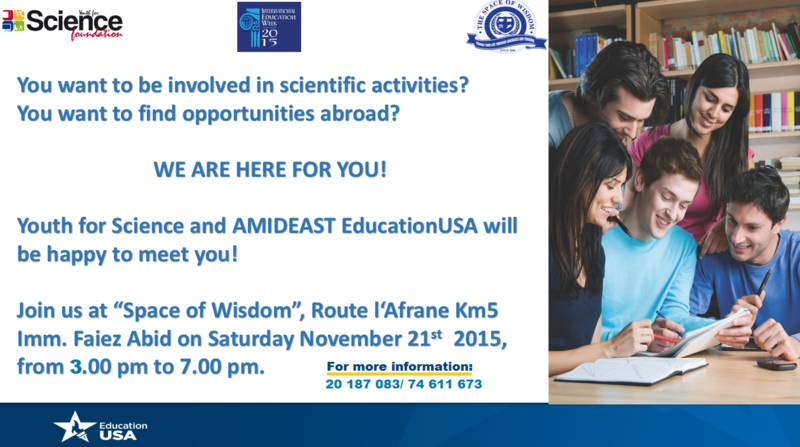 Dear Friends, The Space of Wisdom in Sfax has the pleasure to invite you to attend a workshop which will be jointly organized with Youth for Science Association and Education USA . Teachers, parents and youth aged 14-18 are invited to actively participate in our event which will take place at the Space of Wisdom, Rte de L'Afrane km 5. Sfax. I would be grateful if you could share the attached flyer and program with your friends and contacts and ask them to book a seat before Friday 20 November, 2015. Note that the workshop will be capped at 70 participants.